(White Baneberry (Actaea pachypoda) - 01) We spotted this white baneberry while walking on the path in the park next to our home. White baneberry grow to heights of one to two feet. Red baneberry is very similar in appearance, but the stem of the white baneberry is thicker than the red. To be absolutely sure of the identification, you may want to wait until the berries develop, which are the color of the name. Each little flower in the clusters is only about 1/4 inch across. 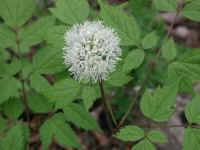 Baneberry are members of the Buttercup family.